Replacement VMC-MD2 VMCMD2 USB and A/V Audio Video RCA Multi-Use Terminal Cable Cord for SONY Cybershot DSC-H20, DSC-HX1, DSC-HX5, DSC-HX5V, DSC-HX55, DSC-H55, DSC-T500, DSC-T900, DSC-TX7, DSC-W210, DSC-W215, DSC-W220, DSC-W230, DSC-W270, DSC-W275, DSC-W290 Digital Cameras. 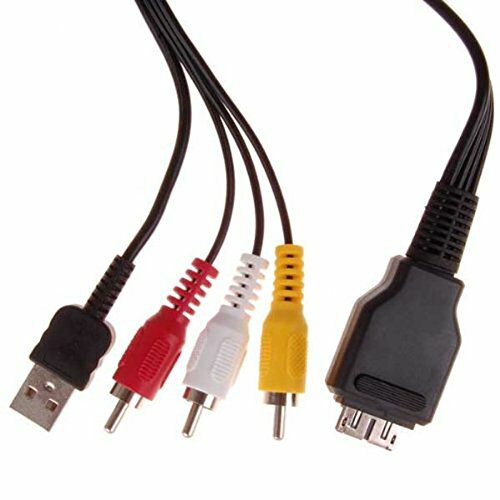 This cable is used to connect your Sony Cyber-shot Camera using its USB termnal to your PC/Mac/TV plus allows you to bring your digital images and videos with audio to your TV screen using its audio and video out terminals. This cable is a replacement for cables with the following Sony model/part numbers: VMC-MD2, VMCMD2. Precision connectors and twisted-pair construction to ensure high-speed and error-free date transfer. If you have any questions about this product by CEXO, contact us by completing and submitting the form below. If you are looking for a specif part number, please include it with your message.